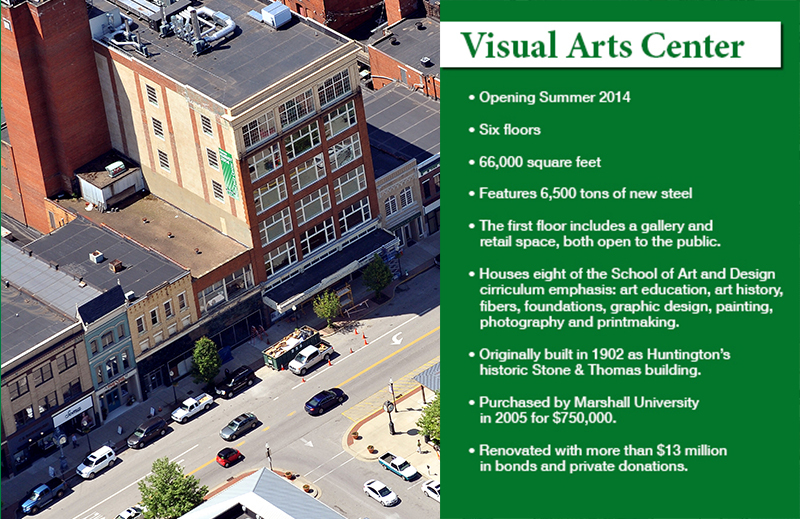 Housing eight programs from the School of Art & Design, the six-floor Visual Arts Center stands to bridge Huntington’s historic downtown and the future of Marshall University. 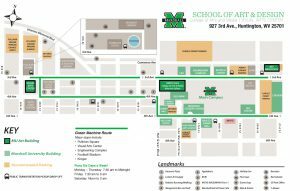 Marshall University’s Visual Arts Center in downtown Huntington paints a picture of old meets new: The site of the VAC, once the historic Anderson-Newcomb Co. building, was built in 1902 — the same year Marshall began its visual arts program. The $13 million transformation to remarkable, world-class visual arts facility incorporates of the building’s original hardwood floors with 65,000 pounds of new steel, smart lighting, highly-efficient heating and cooling and Wi-Fi throughout. Art education, art history, fibers, foundations, graphic design, painting, photography and printmaking students will study and create throughout interactive spaces from the second through the sixth floors. The structure is capped with sixth-floor administrative space and a picturesque view of downtown and six blocks of the Old Main Corridor that leads to Marshall’s main campus. See the video about the Visual Arts Center. If you are interested in submitting a proposal for an exhibition at the Charles W. and Norma C. Carroll Gallery, please use Exhibition Proposal. The gallery dimensions are available here.